In last week’s throwback post, I shared some images and clips of Jessie in a sequin-and-glitter-encrusted outfit for the 2000 Oscars. But that wasn’t the only occasion my favorite cowgirl got dressed up for that year. 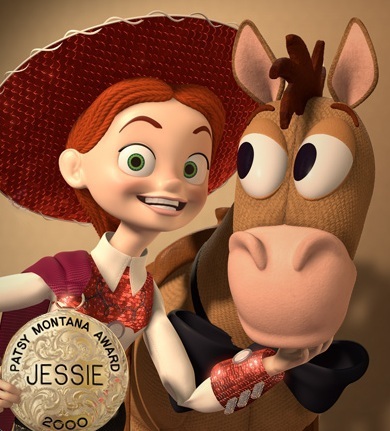 Did you know that, also in 2000, Jessie was honored with the Patsy Montana Entertainer Award by the National Cowgirl Museum and Hall of Fame? According to the museum’s website, the award was named for Patsy Montana – an entertainer and “yodeling cowgirl” herself – and it recognizes those whose work in the entertainment field continues the tradition of the cowgirl. Jessie is even listed on the site as a recipient!